The 2013 Wood Bison Silver Bullion Coin features a depiction of the animal galloping in a display of strength and endurance. 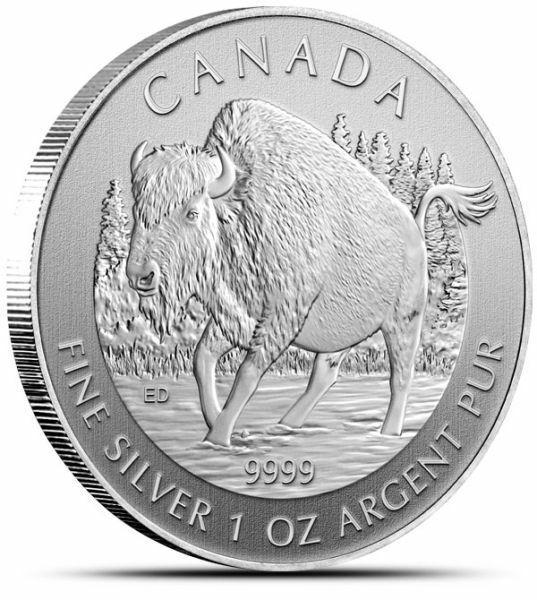 Similar to the two prior releases, the image is framed within a circular area with the inscription “Canada” above and “Fine Silver 1 oz Argent Pur” below. The fineness of “9999″ is included within the image area. The reverse design is by Canadian artist Emily Damstra. Although the coins are part of a bullion series with corresponding pricing and availability, a maximum of one million will be produced by the Royal Canadian Mint Ottawa facility. The mintage limit and the appeal of the alternating designs provides the potential for appreciation outside of the bullion value. The concept of limited mintage bullion releases has been used by other world mints. The RCM’s Wildlife series seems to have achieved a measure of success and popularity with bullion investors and coin collectors. This may set the stage for similar series in the future. The “Wood Bison” design was announced at the World Money Fair in Berlin. The RCM has indicated that the coins will soon be available through their network of bullion distributors, although no exact date has been specified.